Unified description; transverse momentum distributions of identified particles; interacting system; $pp$, $p(d)A$, and $AA$ collisions at high energies. 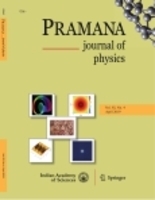 Using a unified description on multiplicity distributions of final-state particles, the transverse momentum distributions of identified particles produced in proton–proton $(pp)$, proton– and deuteron–nucleus $[p(d)A]$, and nucleus–nucleus $(AA)$ collisions at high energies are studied in this paper. We assume that the transverse momentum distributions of identified particles measured in final state are contributed by a few energy sources which can be regarded as partons or quarks in the interacting system. The particle is contributed by each source with gluons which have transverse momentum distributions in an exponential form. The modelling results are compared and found to be in agreement with the experimental data at high energies.